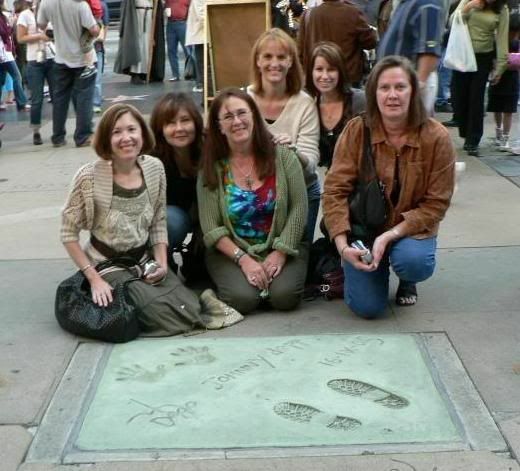 Here we are at Grauman’s! Liz, dharma_bum, Gypsylee, luvdepp, DepplySmitten, and DITHOT. Sorry all you get is us for now. Johnny pictures will be coming when KYwoman and DepplySmitten get connected. What a beautiful crew...I know you all had such fun. Looking forward to more pics! Enjoy the beach! Wow - it's so great to see you all!!! What beautiful smiling faces and what a weekend to remember -- Have fun at the beach!! And thanks for thinking of us with these exciting and teasing little updates - Glad you're all having fun together !! Glad you are all enjoying yourself. It was great meeting up with all of you and putting faces to the names. I heard you all hollaring to Johnny from that second row. I was two rows up higher. Glad you got to Gaumans. Do you know I lived in LA area for 30 years, and I've still never gotten over there. Something to do with not seeing what is in your own back yard. I was there in spirit ladies!!! thanks for the calls! What a beautiful group of JD crazy women. I am absolutely green with envy! Keep the pics and stories coming. thank you for sharing that lovely photo of you all. Such beautiful, happy, smiling faces! Looking forward to more stories and pictures! It's a great day to be at the beach, any beach in SoCal! What a gorgeous smile all of you have! I wish I could meet you girls one day! It must be fantastic! And I can't wait for hear more about it! What a lovely group of ladies!!! Thanks for sharing the pic with us! Sure wish I could have been there, I know that it will definetly be a night to remember for all you ladies! Can't wait to hear more about it soon! What a lovely picture of a group of beautiful ladies, you look to be having a great time. How many of you put your hands and feet where his had been, come on confess all! Just look at that motley group of miscreants that they allow to hang around Johnny's prints. It looks like you had a really good time...correction, are HAVING a really good time on your Johnny-vacation. Uh-oh...am I writing in "envy" green again?